The Athlone man putted the lights out to shoot a best of the day, six under par 65 at demanding Olgiata Golf Club in the northern outskirts of the Eternal City and leap 21 places up the leaderboard into a share of sixth position – just three strokes behind leader Gregory Molteni of Italy. Moriarty arrived at the penultimate event of the Challenge Tour season knowing he needed to earn €11,000 (a top three finish) to qualify for the season-ending Grand Final, where the top 20 players in the Rankings will win a place on The 2012 European Tour. Currently 66th, the Irishman looked to have very little chance of achieving his goal on Friday evening as the second round drew to a close. Moriarty was one over par with three holes to play at that point, but two birdies to end the day saw him finish strongly and he used that momentum to produce the goods in Saturday’s third round. His 65 was his lowest score on tour since he closed with 64 in the Fred Olsen Challenge de España 475 days ago. “It’s always nice to keep it interesting until the last second isn’t it?” smiled Moriarty after signing for his 65 that propelled him to seven under par for the tournament. “It certainly makes it interesting for tomorrow. I didn’t play that much better today than the first two days – the only difference out there was the putting. I had 24 putts today which, for me, is huge and that enabled me to putt the score together. “I know I need a top three finish but I’ll be going out there to win tomorrow. There is no point in having a lesser target. I am here to win and if I can do that then everything else will take care of itself. 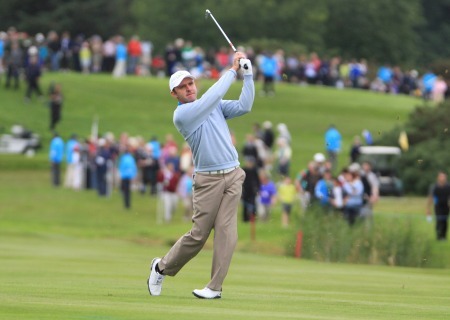 Simon Thornton endured a frustrating third round, carding a one over 72 to lie of four under, in a tie for 14th place, going into the final round. The County Down 34 year old, currently 15th in the Rankings, is looking for a big finish to try and break into the top ten and secure the best possible European Tour card for next year. Things are looking up for Colm Moriarty. Photo Jenny Matthews/www.golffile.ieColm Moriarty believes he has turned a corner with his confidence after he remained in contention at the Credit Suisse Challenge, writes the European Challenge Tour.